The Supreme Court’s terrible—and dangerous—ruling this week on the Fifth Amendment. 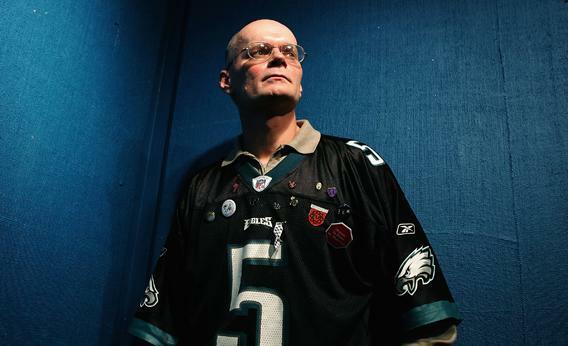 Nick Yarris poses for a portrait session amid the “After Innocence” interviews at the Starbucks Sundance Interview Headquarters during the 2005 Sundance Film Festival on Jan. 23, 2005, in Park City, Utah. On Monday, in a case called Salinas v. Texas that hasn’t gotten the attention it deserves, the Supreme Court held that you remain silent at your peril. The court said that this is true even before you’re arrested, when the police are just informally asking questions. The court’s move to cut off the right to remain silent is wrong and also dangerous—because it encourages the kind of high-pressure questioning that can elicit false confessions. Here are the facts from Salinas: Two brothers were shot at home in Houston. There were no witnesses—only shotgun shell casings left at the scene. Genovevo Salinas had been at a party at that house the night before the shooting, and police invited him down to the station, where they talked for an hour. They did not arrest him or read him his Miranda warnings. Salinas agreed to give the police his shotgun for testing. Then the cops asked whether the gun would match the shells from the scene of the murder. According to the police, Salinas stopped talking, shuffled his feet, bit his lip, and started to tighten up. At trial, Salinas did not testify, but prosecutors described his reportedly uncomfortable reaction to the question about his shotgun. Salinas argued this violated his Fifth Amendment rights: He had remained silent, and the Supreme Court had previously made clear that prosecutors can’t bring up a defendant’s refusal to answer the state’s questions. This time around, however, Justice Samuel Alito blithely responded that Salinas was “free to leave” and did not assert his right to remain silent. He was silent. But somehow, without a lawyer, and without being told his rights, he should have affirmatively “invoked” his right to not answer questions. Two other justices signed on to Alito’s opinion. Justice Clarence Thomas and Justice Antonin Scalia joined the judgment, but for a different reason; they think Salinas had no rights at all to invoke before his arrest (they also object to Miranda itself). The upshot is another terrible Roberts Court ruling on confessions. In 2010 the court held that a suspect did not sufficiently invoke the right to remain silent when he stubbornly refused to talk, after receiving his Miranda warnings, during two hours of questioning. Now people have to somehow invoke the right to remain silent even when they’re not formal suspects and they haven’t been heard the Miranda warnings. As Orin Kerr points out on the Volokh Conspiracy, this just isn’t realistic. The Supreme Court’s decision in Salinas encourages the kind of loosey-goosey, and easily contaminated, police questioning that led to Yarris’ wrongful conviction. Salinas may very well have been guilty of the two murders. But in many cases, as in this one, there are no eyewitnesses and not much other evidence of guilt: That is why the police may desperately need a confession. And that makes it crucial for them to handle interrogations and confessions with the utmost care. The court appreciated none of the pressures police face, and how they can squeeze an innocent suspect. Alito and the other conservatives were not troubled that there was no video to confirm that Salinas was in fact uncomfortable as well as silent. If Salinas had answered the question by exclaiming that he was innocent, could police have reported that he sounded desperate and like a liar? The court’s new ruling puts the “defendant in an impossible predicament. He must either answer the question or remain silent,” Justice Stephen Breyer said in dissent (joined by the other three liberal-moderates). “If he answers the question, he may well reveal, for example, prejudicial facts, disreputable associates, or suspicious circumstances—even if he is innocent.” But if he doesn’t answer, at trial, police and prosecutors can now take advantage of his silence, or perhaps even of just pausing or fidgeting. Questions first, rights later is the approach the court’s majority now endorses. And by giving the police more incentive to ask questions informally, the new ruling will also undermine the key reform that police have adopted to prevent false confessions: videotaping entire interrogations. Why not try to trap a suspect before the camera starts rolling? In only a few cases like Yarris’ will there be DNA to test. The likely result of the court’s embrace of shoddy interrogation tactics: more wrongful convictions.